I love a good thriller, and so was excited to get this review copy in the mail last month. The premiseis interesting, the characters mainly believable, and the well-layered plot drives you along, just not as intensely as I would have liked. I won't offer any spoilers, but the general idea is that the five Cambridge spies were actually six, in that one more associate spun off to Oxford, worked for the Soviets for awhile, then flipped into a double agent. The first part of the book is all about a London prof and biographer of the current Russian leader (Sergei Platov, a paper-thinly-veiled riff on Vladimir Putin) who is in financial straits and needs a new bestseller book deal. And certainly a book revealing a sixth spy in the infamous ring would lead to that. But when the main character turns over that rock it reveals all manner of slimy and unpalatable creatures, deaths ensue, there is international travel and intrigue, a chase, and a new, deeper, darker mystery unfolds, one that British intelligence has been hiding for decades. Again, the idea and premise of the plot is good. I just found the execution too predictable. 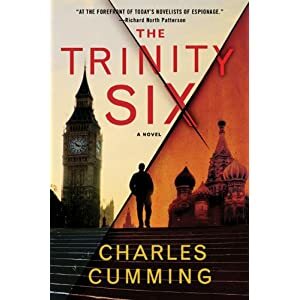 I knew who the sixth man was too quickly and the essence of the second secret, if an interesting idea, was neither surprising nor entirely credible (some scenes drawn in the Kremlin might have helped). Maybe I just read too many thrillers. The main character, Sam Gaddis (a choice of last name as homage to one of the great Cold War scholars, perhaps?) is well drawn and believable, if a bit more adventurous than one would expect a college prof to be. And the story is entertaining enough and full of some interesting bits of history. Koroche, in the end, this is a decent beach read that could have used a bit more tension and might have benefited from a bit more Russian flavor.